A gift voucher for 10 persons for the Goat’s Draft Beer Workshop in Czech experience program. Looking for a truly original gift? 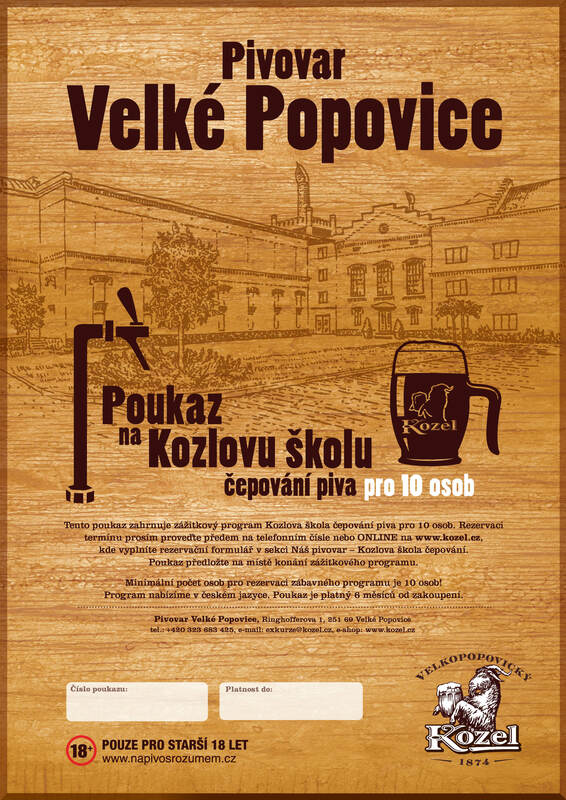 Treat yourself, your friends or family members to a voucher for the Goat’s Draft Beer Workshop at the Velké Popovice Brewery. You can look forward to a unique beer experience. The Goat’s Draft Beer Workshop gift voucher includes a standard brewery tour, including a tasting of unfiltered beer in the brewery cellars, followed by a draft beer workshop presented by a brewing expert. Entrust yourself to an expert who will explain the right way of taking care of beer and how to recognise whether the beer in your favourite pub has been treated properly. And naturally, you will get hands-on experience in pouring beer. You will try out how to pour a proper glass of Velkopopovický Kozel beer, and you will have a chance to try to pour an 11-degree beer or a black & tan beer. Those who have received the gift voucher can book a specific date of the workshop at least 5 day in advance on +420 323 683 425. Should you be interested in the experience program in English, please don’t hesitate to contact the Visitor Centre on +420 323 683 425. The Goat´s Draft Beer Workshop for 10 persons voucher is sent to visitors in electronic form. Upon purchase of the voucher, all you need to do is enter your email address and select the method of payment. You can either pay online by card or by bank transfer. Once the respective amount is credited to our account, you will receive the e-voucher, which you then print out and use as appropriate. The voucher is transferable, which is why you can use it as a gift.